Stress is a normal part of life but when it continues without relief then it can have a negative impact on your health, not to mention your personal and professional lives. It is increasingly becoming a common denominator in a number of diseases as it tends to exacerbate just about any health condition. In fact, it is believed to be the basic cause of 60 percent of disease and illness. 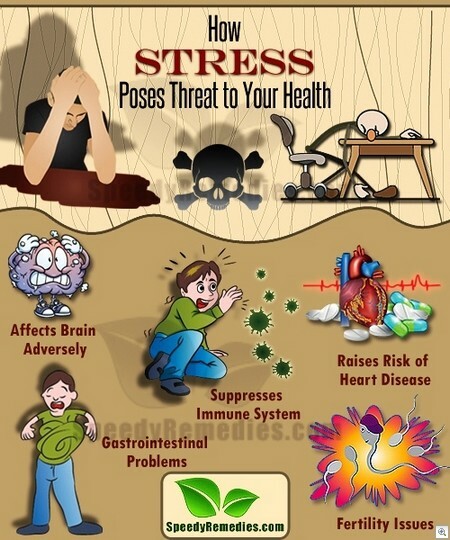 For example, stress worsens or increases the risk of developing conditions like obesity, heart disease, diabetes, asthma, gastrointestinal problems. Plus, it is one of the most common triggers of headaches. Even in terms of metaphysical causes of diseases, stress is considered a major contributor for several health problems. According to the American Psychological Association, almost 77% people regularly experience physical symptoms of stress and almost 73% people regularly experience psychological symptoms of stress. Given below are some ways in which stress can pose a threat to your health. Although some amount of stress can help maintain optimal levels of alertness and cognitive performance, excessive or chronic stress may actually be bad for your brain. Chronic stress and anxiety and depression are associated with an increased risk of developing dementia and Alzheimer’s disease. Neuroscientists believe that chronic stress can trigger long-term changes in the brain structure and function. It can also change neural networks, kill brain cells, and impact memory and learning. According to a 2008 University of California study, even short-term stress can impair brain-cell communication in the regions of the brain associated with learning and memory. Moreover, in 2012, a Yale University study published in the journal, Nature Medicine found major depression or chronic stress can actually cause loss of brain volume and thus contribute to both emotional and cognitive impairment. To beat stress and improve your brain health, start practicing relaxation techniques such as deep breathing meditation, yoga, visualization or guided imagery, and the same for at least 20 minutes a day. When under stress, you undergo a fight or flight response in which the brain signals the adrenal glands to produce stress hormones called cortisol and adrenaline. Continually dealing with this stress response tends to interfere with the immune system eventually affecting its ability to fight off antigens, thus making you more vulnerable to infections and illnesses. Soaring cortisol levels, in particular, wreak havoc on the immune system in turn leading to issues like frequent colds and other infections, tendency to develop food allergies and a number of autoimmune diseases, and even an increased risk of cancer. Chronic stress causes the body to lose its ability to regulate inflammatory response. The stress hormone cortisol partly helps regulate inflammation but prolonged stress tends to reduce its effectiveness in doing so, thus promoting runway inflammation leading to the development and progression of diseases. In addition, people often incorporate unhealthy strategies like smoking and drinking alcohol to cope with stress which ultimately do more harm. High levels of stress hormones tend to increase heart rate which puts more strain on the circulatory system, thus increasing blood pressure, which in turn raises the risk of coronary heart disease. Moreover, those with Type A personality are more prone to heart disease. Plus, the stress hormone cortisol also makes you crave carbohydrates and fats, thus contributing to weight gain. It makes you more susceptible to gain weight in the abdominal area or visceral fat storage which in turn is linked with increased risk of heart disease and diabetes. To reduce stress and lower the levels of stress hormones, you can take up relaxing activities like gardening, exercising and listening to music, Eating a little dark chocolate, about one square of a bar par day can also help relieve stress and protect against cardiovascular disease. Interestingly, keeping and maintaining a pet is also considered good for combating stress. Research indicates heart attack patients who have pets survive longer than those who don’t have pets. Stress also causes digestive disruptions and problems like indigestion, stomach ache, constipation, heart and upset stomach. It slows the release of stomach acid and reduces digestive activity as it is not essential during short term crisis. Stress also contributes to and worsens issues like irritable bowel syndrome, ulcers and colitis as it triggers inflammation. 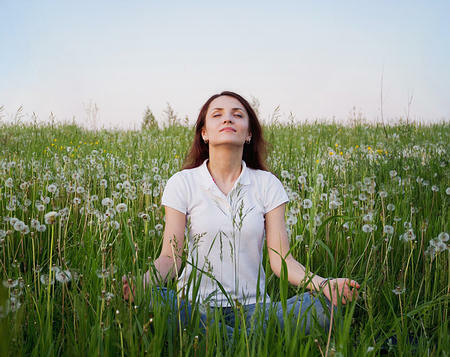 People have reported improvement in these conditions with improved stress management. Chronic stress is one of the common risk factors for fertility problems. Stress hormones affect the hypothalamus that produces reproductive hormones. This in turn causes changes in a female’ menstrual cycle and normal ovulation, and reduces sperm count in males. It can also lead to lack of libido and erectile dysfunction. A 2014 study conducted by researchers at the Ohio State University has linked high levels of long-term stress with increased risk of infertility. So, if you are having difficulty trying to get pregnant then consider following some stress-reduction techniques such as yoga, deep breathing, meditation and mindfulness.